Dishes with quinoa grains are quite popular, especially among lovers of tasty and healthy food. The products in the recipe are based on 4-6 servings. Prepare "Pesto" sauce from greens, garlic, pine nuts and butter (olive). Prepare the shrimp. We defrost the shrimps, wash them under running water and clean them from the shells (if large, make a cut along each back and remove the black vein). Put the shrimp on paper towels and dry well. Sprinkle with table salt and a bit of sugar. Thawed shrimp better slowly - then they will lose less juice. For this defrosting, shrimp is laid out in a colander and put on top in the fridge (place the cup on the bottom so that the glass is water). In about a day they will thaw. The time depends on the temperature of the refrigerator. If there is no time for a long defrosts - at home temperature, the shrimp will be defrosted in a couple of hours. Preheat 5 tbsp. spoons of oil (olive). In a well-heated butter, lay out the shrimp and fry for about 1-2 minutes on all sides. 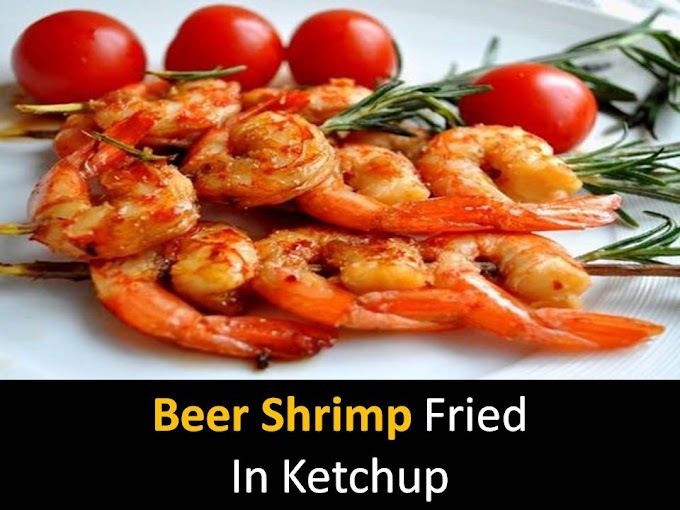 Shrimps are cooked as soon as they turn pink, and the flesh becomes matte (that is, ceases to be transparent). 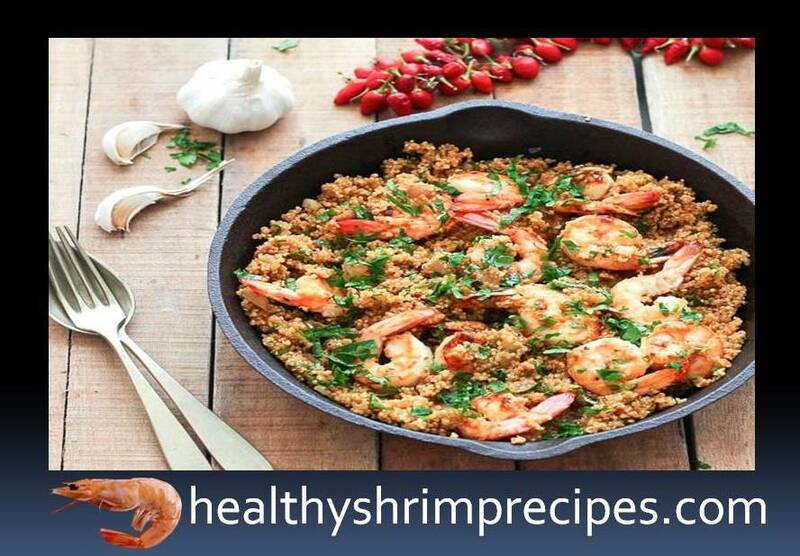 Add chopped garlic in small pieces to the shrimp pan, stir and remove the pan from the flame. Instead of raw shrimp, if desired, take boiled frozen. They do not need to be prepared for a long time; otherwise, the meat will become tough. 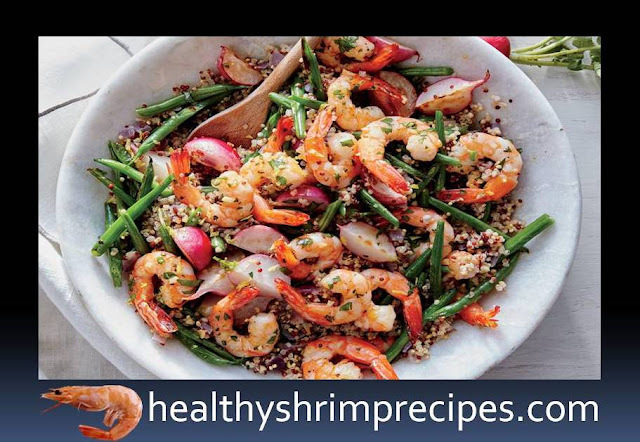 Defrost the shrimps, if necessary, remove the black vein, rinse, dry, and then slightly warm it for about 30-40 seconds on a strong or moderate flame. The truth of this taste, as from raw tiger or royal, these shrimp will not give. Cook quinoa. Rinse the rump with cool water and put in a saucepan. Fill with 600 ml of boiling water, salt and boil for about 15 minutes, before cooking. The ratio of quinoa to water (or broth) is 1: 2 - for one lobe of cereal two parts of water. During the preparation of quinoa will increase in volume by about 4 times. Move the quinoa into the cup and combine with the pesto sauce. Put the quinoa with the sauce on the dish and serve together with the shrimps.